Activated Charcoal // Treated with oxygen to create more active regions to chemically bind with toxins (hence why it is called “activated” charcoal!). 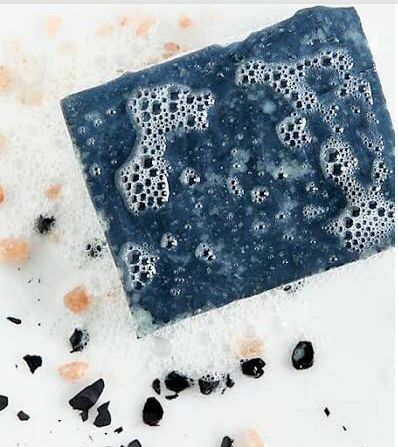 When applied topically, activated charcoal soap stick to and pull out dirt, oil and toxins, providing a deep clean that helps prevent breakouts. Tea Tree essential oil // Shown to have antibacterial, antimicrobial, antifungal, and immune stimulating properties. Studies have shown that topical application of Tea Tree essential oil can help alleviate acne by killing the bacteria that causes breakouts. Neem oil // Consider this a centuries old cure-all. The anti-bacterial and anti-inflammatory properties in neem oil are only a portion of what this miracle healer been used for. As the go-to remedy for a multitude of ailments and everyday practices in Indian medicine and ayurvedic practices, neem is rich, fragrant, and potent solve for troubled and irritated skin. It has even been used to brush teeth! Dead Sea salt // Unlike sodium chloride, which regular sea salt is made of, Dead Sea salt is rich in minerals like magnesium, calcium and bromide which help level out some of the root causes of acne like high cortisol production and hormonal imbalances. These minerals, when absorbed in the skin, also stimulate detoxification, reduce inflammation, and improves how well skin retains moisture. Wet hands and massage the Activated Charcoal + Dead Sea Salt Soap until a rich, creamy lather forms. Massage the foam into wet skin to gently remove dirt, makeup, SPF, and any other signs of the day. Rinse with warm water or use a damp towelette to get rid of stubborn makeup. The scent of tea tree and neem oil are refreshing and not overpowering. This soap does an excellent job in cleaning the skin without stripping the moisture out of it. Overall improvement in the skin texture too. Definitely a repurchase and an excellent value for money. Love how this soap is making my skin feel so soft and cleared up. I absolutely love this soap! I’ve been using it for over a year now and it helps with my breakouts. So much so, that my acne is non existent. I use the other products in this line as well. I really like that Apoterra makes soaps that feel seasonal, and I enjoy switching it up with a new scent every few months. While I use the Activated Charcoal soap on my face in the summer, I use it year-round on my body. Especially on breakout-prone areas on the back. It smells really fresh & is effective!